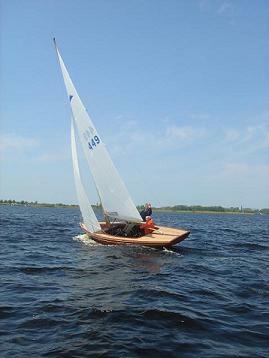 My first real boat was a Pampus, a Dutch national class since 1934. I bought it second-hand in 1959, while still at school, after years of small-time jobs and saving every penny, from the first owner who had had it since 1938. (For pictures of the nowadays Pampus, look at http://www.verenigingen.sport.nl/knwv/pampusclub/). I'm sorry it's a Dutch site, but anyway the pictures are international! When it was designed, the boats with more than 16 m2 of sail were taxed because they were "luxury goods" so the Pampus (named after a fortress-island in the Zuiderzee, east of Amsterdam), had less than 16m2, while the boat had been designed for more, so, as the boat had not been registered for racing, I replaced the rig with a bigger (22m2) one, and after some trimming experiments brought it back to about 20m2, which proved satisfactory. The dimensions of the hull: length 667 cm., width 170 cm., depth of the keel 80 cm., weight about 800 kg. I sailed it for two summers and three winters, mainly on the lakes in Holland and Friesland, the rivers Rhine and Maas and the IJsselmeer, the big central lake, formerly known as Zuiderzee. It was a nice, easy gentleman's boat to sail, thought a bit wet because of the spray. The modern ones are a lot faster than mine was; of course they'll never plane but are fast enough to have a lot of fun. They are normally crewed by two, but I mostly sailed it alone. I also made some trips with my father, my great tutor in seaman- and sailorship, until he became ill in '71 and died a year later.